Mims and I went to a baby shower last night. It was for Jake's cousin Ro. She and her husband are expecting a boy in September. So exciting! So why did I make a baby girl onesie on Friday?! 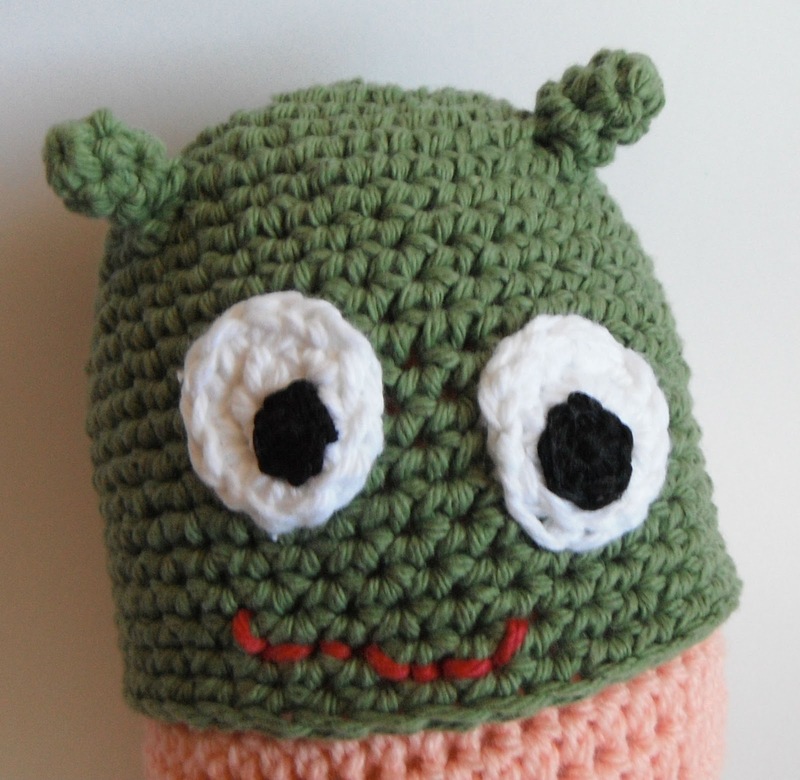 ::shaking my head in disbelief:: Anyhoo, I wanted to make something cute to take to the shower, so I whipped up an awesome Monster Beanie. Sew horns to hat approximately 2 inches down from the top-center of the hat (which was about R8). I spaced my horns 2.5 inches apart. Sew iris to eyeball. 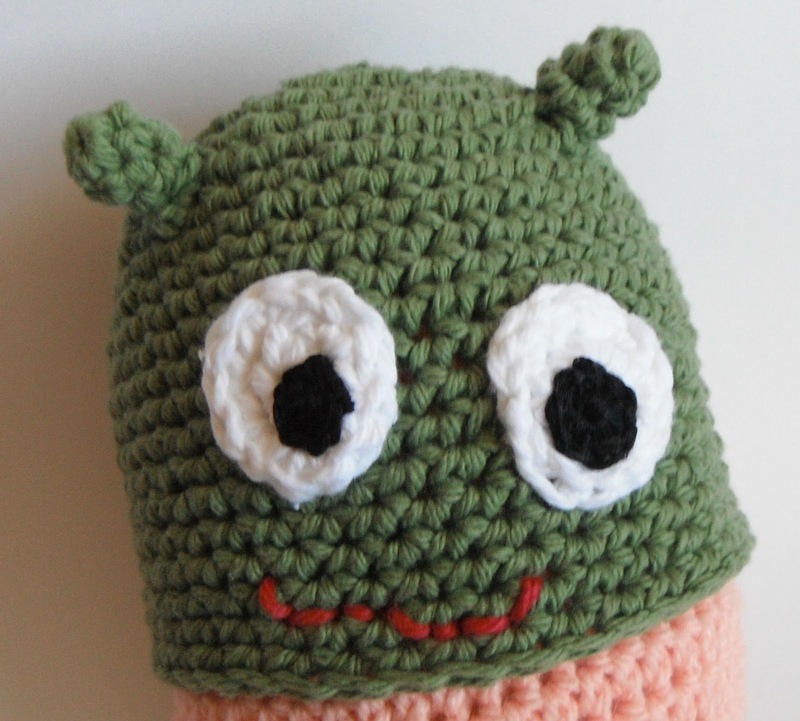 Using photo as guide, sew eyes to front of hat. Using Mouth-line Color and the backstitch, add a mouth line. Quirky smiles are always cute! It would be easy to make this beanie for larger sizes, just make the hat bigger. This site has a list of measurements to help you out. And as always, if you make one you can add your picture to the Dynamo Gallery! Just send me a jpg in an email! I'll even link it to your site, if you'd like! When we got home from the shower it was still 85 degrees out, which meant that it was even hotter in the house. What were two overheated girls to do?? Yeah, we made mint limeade. Mims helped me squeeze the limes, and wash the mint. I made a simple syrup and infused it with mint, chopping the remaining mint to add to the finished limeade. We poured it over ice, adding extra water because it was STRONG. That made it just perfect for a hot, sweaty night. We went upstairs and Mims watched a Netflixed episode of Wizards of Waverly Place while I put up a new Google+ page for Crochet Dynamite. So if you Google+ you can now add the blog to your circles! That monster beanie is cute and a half. I made one last night. Thanks for the pattern and good explanation! Thanks Diane! And thanks also for pattern testing this for me! Win win! Glad it worked! LOL!!! I think Amos would look good in a beanie... And I think a picture of Amos in a beanie would look really good in the Dynamo Gallery... LOL!!! Ok I'm really new at crochet...what is the 'magic loop'?